Stochastic decomposition (SD) has been a computationally effective approach to solve large-scale stochastic programming (SP) problems arising in practical applications. By using incremental sampling, this approach is designed to discover an appropriate sample size for a given SP instance, thus precluding the need for either scenario reduction or arbitrary sample sizes to create sample average approximations (SAA). SD provides solutions of similar quality in far less computational time using ordinarily available computational resources. However, previous versions of SD did not allow randomness to appear in the second-stage cost coefficients. In this research, we extend its capabilities by relaxing this assumption on cost coefficients in the second-stage. In addition to the algorithmic enhancements necessary to achieve this, we also present the details of implementing these extensions which preserve the computational edge of SD. Finally, we demonstrate the results obtained from the latest implementation of SD on a variety of test instances generated for problems from the literature. We compare these results with those obtained from the regularized L-shaped method applied to the SAA function with different sample sizes. upon scenario trees to provide certain representation of the underlying stochastic process. When this process exhibits stage-wise independence, sampling-based techniques, particularly the stochastic dual dynamic programming (SDDP) algorithm, have received wide acceptance. However, these sampling-based methods still operate with a deterministic representation of the problem which uses the so-called sample average approximation. In this work we present a sequential sampling approach for MSLP problems where exogenous uncertainty follows a stage-wise independent stochastic process which we refer to as the stochastic dynamic linear programming (SDLP) algorithm. Since we employ sequential sampling, the algorithm does not necessitate a-priori representation of uncertainty, either through scenario tree or sample average approximation, which require the knowledge/estimation of underlying distribution. In this regard, SDLP is a distribution-free approach to address the MSLP problems. We employ regularization at non-terminal stages and has a piecewise-affine policy discovery scheme to identify incumbent solutions used in the regularization term embedded into the algorithm. The SDLP algorithm is shown to provide asymptotically convergent value functions and an optimal solution, with probability one. H. Gangammanavar and S. Sen, Stochastic Dynamic Linear Programming: An Online Multistage Stochastic Programming Algorithm, 2018. This work is motivated by a power system with storage devices at multiple locations which need to be controlled at a much finer timescale than that necessary for conventional generation units. We present a stochastic optimization model of the power system which captures interactions of decisions at these two timescales through a novel state-variable formulation. The model also includes transmission constraints approximated by a linearized DC network, fast response operating reserves and renewable generation. To tackle this high-dimensional multistage stochastic optimization problem, we present a sequential sampling method which we refer to as the Stochastic Dynamic Linear Programming. This algorithm is a dynamic extension of regularized two-stage stochastic decomposition for stagewise independent multistage stochastic linear programs, and is targeted at the class of problems where decisions are made at two different timescales. We compare our algorithm with the stochastic dual dynamic programming (SDDP) which has been effectively applied in planning power systems operations. Our computational results show that our sequential Monte-Carlo approach provides prescriptive solutions and values which are statistically indistinguishable from those obtained from SDDP, while improving computational times significantly. This set of work is motivated by the difficulty in operating power systems with significant renewable generation. Due to intermittent and uncertain nature of renewable generation, particularly wind and solar, obtaining a set of scenarios which reliably capture these characteristics is difficult. 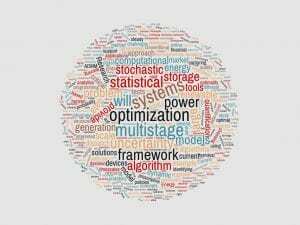 Therefore, this work proposes a stochastic programming framework which combines optimization with sequential sampling of scenarios which can potentially be generated by state-of-the-art generators. Our results demonstrate that when compared with standard approaches, the sequential sampling approach provides better solutions with significantly less computational time. We have applied this framework to solve the sub-hourly economic dispatch problem, and to estimate operating reserve requirements. In developing countries immunization programs often involve targeted outreach services in remote locations. Organizations managing these programs are in need of tools which identify inventory replenishment and vaccine utilization plans to minimize costs and wastage while achieving greater coverage level. Wastage incurs when doses are discarded from open vials after their safe use time. The goal is to identify portfolios of different sized vaccine vials, and policies to determine how these vials are opened when patient arrivals are uncertain. Our approach provides tools to develop simple and economic vaccine administration policies usable by healthcare administrators. Second place in INFORMS Minority Issue Forum Poster Competition, Annual Meeting 2016, Nashville, Stochastic Vaccine Vial Replenishment and Administration Optimization: A case study in Bangladesh.